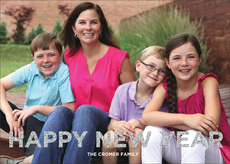 When you can’t be there in person, sending custom New Year cards to your friends and family is a great way to show them you care. A customized New Year’s card gives you the ability to make a personal statement and have it look professional at the same time. 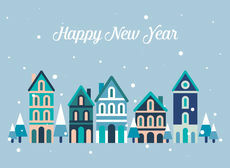 Your typical store-bought Happy New Year cards can't always convey everything you want to say, so why not take matters into your own hands with a personalized card? 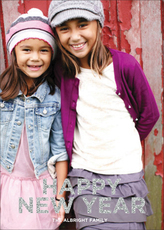 You can print your own message in your choice of fonts on one of many card designs. Our cards come in a variety of looks from bold and colorful to elegant and sophisticated and are perfect for any sort of New Year’s greeting you want to send. The designs of the cards are both fun and classy, which makes them just right for both personal and business contexts. Because of the wide range of styles and font choices that are available, these personalized New Year’s cards are perfect for anyone you want to reach out to next year. 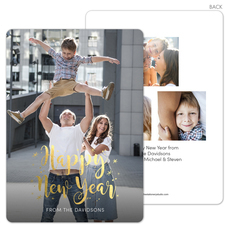 Try sending your loved ones a card featuring photos of your family with a personalized message inside. You could send your friends a card with photos from your adventures over the past last year. You may also use the cards as custom place cards for a New Year’s party with an individualized thank you note as your customized text. 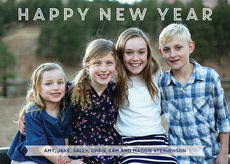 With an array of personalized New Year cards, the possibilities are limitless. Many are even perfect for business New Year's greetings. The countdown is on. 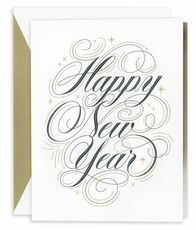 This year, wish your family and friends a Happy New Year with classic chic cards. 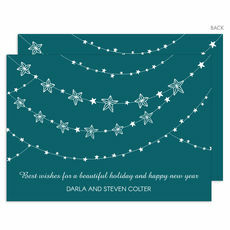 You will find stylish holiday greetings that can are easy and affordable to order at The Stationery Studio. 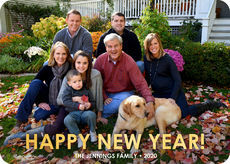 This is a perfect time to wish your family and friends a happy holiday season and a Happy New Year.